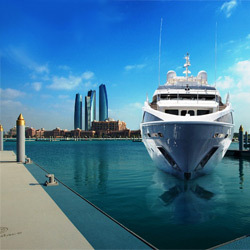 Abu Dhabi royals topped the list as having the most extensive range of superyachts. This year Azzam took over the title of the largest superyacht in the world, beating Russian billionaire Roman Abramovich’s famous mega-yacht The Eclipse. The $592m vessel has an unprecedented length of 180 metres and is still able to reach top speeds of more than 30 knots. The top two new entrants to hit the water in 2013 both belong to Abu Dhabi nationals. After Azzam, the largest entrant is at number 11: Swift135. She is a 135m motor yacht and is due to be launched from ADMShipyards in Abu Dhabi. Swift135 will offer accommodation for up to 60 guests and is also capable of carrying up to 56 crew. “If you buy a boat, it is a contribution to the economy. You are creating jobs in the market,” Haws says. “For a 100-metre yacht, for example, a crew of three full-time people is required. One staff member is paid $2000 per month and a captain is paid $330 per metre on the boat. People see the yacht and see the leisure, but they do not realise the economic impact you have”. Haws worked for Boats International before managing the Emirates Palace Marina and one can clearly hear the passion in his voice as he talks about boats and the yachting industry as a whole. In the UAE, the Emirates Palace Marina is considered by many to be the most prestigious berthing location for a luxury superyacht. According to Berend Lens van Rijn, CEO and founder of Belevari Marine LLC, the yacht industry has an immense impact on the economy, not just onboard, but also in the vessel’s berthing dock. Yas Island is a good example of this. They make $3m alone on berthing fees during the Grand Prix and now also have the Volvo race too. Charter boats are known to go from the Caribbean to the Mediterranean, and Mr Haws hopes that Dubai will soon be part of the annual season for charter boats. This has not been the case yet due to registration, legislation and awareness issues. GCC nationals are known to be very subtle about owning a yacht. They don’t like to announce it, and usually keep it on the Mediterranean.